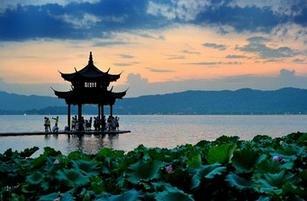 Hangzhou is the capital of Zhejiang province and its political, economic and cultural center. With its famous natural beauty and cultural heritages, Hangzhou is one of China's most important tourist venues. The City, the southern terminus of the Grand Canal, is located on the lower reaches of the Qiantang River in southeast China, a superior position in the Yangtze Delta and only 180 kilometers from Shanghai. Hangzhou has a subtropical monsoon type climate with four quite distinct seasons. However, it is neither too hot in summer nor too cold in winter making it a year round destination. The West Lake is undoubtedly the most renowned feature of Hangzhou, noted for the scenic beauty that blends naturally with many famous historical and cultural sites. In this scenic area, Solitary Hill, the Mausoleum of General Yue Fei, the Six Harmonies Pagoda and the Ling Yin Temple are probably the most frequently visited attractions. The "Ten West Lake Prospects" have been specially selected to give the visitor outstanding views of the lake, mountains and monuments. A number of national museums can be found in Hangzhou and are representative of Chinese culture. Fine examples are the National Silk Museum and Tea Museum. Along with the other museums in Hangzhou, they provide a fascinating insight into the history of Chinese traditional products. One of the most important parts of traveling is tasting the local delicacies. Hangzhou dishes are noted for their elaborate preparation, sophisticated cooking and refreshing taste. Many local specialties will be sure to make your trip a cultural experience. We recommend that you try Beggar's Chicken (a chicken baked in clay), West Lake Fish in Sweet Sour Source (vinegar coated fish fresh caught from the lake), Dongpo Pork (braised pork) and Fried Shrimps with Longjing Tea, etc. The shopping environment in Hangzhou is exciting and convenient. Travelers and tourists like to go to Qing He Fang Street. It is one of the most famous and historic streets in the city and reflects many of the features of the Southern Song Dynasty (1127-1279). Shoppers will admire the antique buildings while purchasing items from a wide range of local goods such as silks, tea or maybe a silk parasol, brocade or a beautiful Hangzhou fan. These are just some of the items to be found but there are many more. At night Hangzhou has much to offer and teahouses and various kinds of pubs are both plentiful and popular. Choosing one overlooking the West Lake for a pleasant chat over a cup of tea is sure to make you feel totally relaxed and refreshed. While much of the ancient city that had been the capital of the Southern Song Dynasty was destroyed during the Taiping Rebellion in the mid-nineteenth century, today's Hangzhou is a modern and vibrant economical center. As such it provides a base for many talented and skilled people. Never the less, thanks to its unique setting by the West Lake it continues to enjoy the many benefits of the natural surroundings that have delighted visitors for centuries. Not only was it much vaunted in his writings by the 13 century explorer, Marco Polo but the Lake and its environs have inspired poets of great renown such as Bai Juyi and Su Dongpo down the ages. There can be no doubt that visit here is certain to be a memorable one.